If you are looking for information on the Novus Auto Glass franchise business opportunity, Novus franchises or Novus Automotive Glass repair franchising, then you have come to the right place. Thank you for taking interest in exploring a franchise opportunity with NOVUS® Franchising, Inc. At NOVUS, we are dedicated to providing superior support and sound operational consultation to our franchisees. Our growth plans include building a strong brand through consistency, pride and unity. Today, we have over 400 businesses in North America, and more than 2,000 business units in 42 countries with over 30 years of experience. NOVUS franchisees enjoy the benefits of the interdependent relationship that exists within our franchise system. We are proud to be able to offer a wonderful variety of products and services to a NOVUS customer such as, Auto Glass Repair & Replacement, Spray on Bedliners, SRP Paint Restoration and SRP Glass Scratch Removal. Our complete support services and network of programs offer credibility and confidence, as they were built on a sound foundation of experience. NOVUS is best known throughout the world as the inventor of windshield repair. NOVUS is also the windshield repair industry's research & development leader and pioneer. In fact, NOVUS has been awarded more U.S. Patents for windshield repair than the rest of the industry combined. NOVUS® is also the world's original "Repair First, Replace When Necessary"® company. "Repair First" distinguishes NOVUS from the average auto glass shop in the eyes of insurance companies, fleets and consumers. 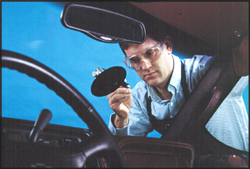 "Repair First" is NOVUS' distinctive competency and is backed by the NOVUS Guarantee that ensures a NOVUS windshield repair will restore strength and clarity to the glass; will halt the further spread of damage; and, will pass vehicle inspection in all states for as long as the customer owns their vehicle or NOVUS will refund the cost of the repair. Over 400 NOVUS franchises in North America and more than 2,000 locations in 42 countries deliver on the NOVUS warranty promise every day. NOVUS franchisees have performed over 20 million high quality windshield repairs. 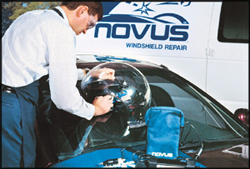 In 1995, NOVUS introduced windshield replacement to our service offerings as a complement to repair. The replacement of windshields and other auto glass parts allowed NOVUS franchisees to qualify as full-service auto glass companies capable of fulfilling every customers auto glass needs. Whether repair or replacement, the 'NOVUS Difference' is readily apparent in the results created by superior training, equipment and the NOVUS franchisees' determination that every job will be done correctly 'first time, every time'. NOVUS customers know the name NOVUS is their assurance of the highest quality, most convenient auto glass service available anywhere. Have you ever wondered why millions of Americans buy franchises? A NOVUS® franchisee explains it best. "I'm in business to make money; I have no time or interest in re-inventing the essential support services NOVUS provides. Besides, NOVUS systems are proven effective. Anything I develop must be re-proven through 'trial and error.'"